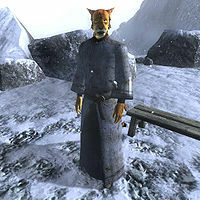 Ri'Jirr is a Khajiit acrobat who is a devout worshipper of the Daedric prince Hermaeus Mora, and can be found with his fellow worshippers at the Shrine of Hermaeus Mora. Chat with Ri'Jirr to find out if you are worthy of Hermaeus Mora's time. Ri'Jirr is a dedicated follower of Hermaeus Mora and can be found wandering around the shrine day and night. He wears a tattered robe and a pair of rough leather shoes. He is armed with an iron dagger and carries a small amount of gold. If you have completed all other Daedric Quests and not started Hermaeus Mora's quest he will say "You have followed the path set for you by the Lord Hermaeus Mora. Approach his shrine and speak with him," otherwise he will say "You have not yet followed the path required to speak with the Lord Hermaeus Mora."